Born in the beginning of twenty century in the historical center of Borgo San Lorenzo, as a dairy and gelateria by the Barletti consorts, the Aurelio cake shop will became such alone after war. 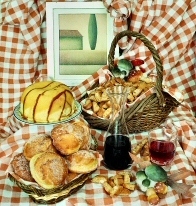 Aurelio, Barletti's child, enriched his production with cakes, fresh and dried pastries. Aurelio's child has continued the walk of his father then, also widening the production to the workmanship of choccolate, experimenting new recipes that enrich the vast cookbook of the Aurelio's cake shop. The wife getting more experienced, after numerous courses of window-dressing and wrapping, known how to created new wrapping style and propose to her own costumers the way to wrap tipycal florentines and ceremony cakes. In september 2001, the cake shop Aurelio, has decided to inaugurate a second sale point, that in only two years is placed side by side to the already affirmed previus one and offer the possibility to have a rest for a pleasant lunch break.